This 52.4m (172’) yacht was delivered in 1997 by Abeking & Rasmussen, constructed from steel, with an aluminium superstructure. For FM- Architettura d’Interni, the refit was a real challenge — the project started in January 2014 and needed to be delivered by the end of May 2014. The boat was refitted in partnership with the CRN Shipyard Ancona, and all the interiors have been updated, starting with refitting of insulation and air conditioning systems, up to the choice of furniture items and décor. This has significantly increased comfort on board in terms of acoustics and living spaces. The main deck was been completely rebuilt. Forward, there used to be two double cabins, and these have been transformed into one large space for exclusive use of the owner. The former VIP salon has been transformed into an elegant office with relaxing armchairs. The saloon has also been completely remodelled with an extendable round table, accommodating up to 12 people, designed by FM – Architettura d’Interni. There are now Promemoria sofas and chairs, and there is even a table-football table. The upper deck saloon is colonially inspired, and features a large C-shaped sofa, equipped with side tables and a coffee table designed by FM – Architettura d’Interni. The lower deck has three en-suite double cabins and a very large playroom. Liveliness and relaxation are important in an area dedicated to the youngest members of the family. In the aft area, whose access is through private staircase winding down from the main deck, there are two more large VIP cabins, one with twin beds and the other with two queen beds, each with private bathroom and walk-in closet. This superyacht is fitted with two C1400 KW CAT engines, reaching a maximum speed of 16 knots. 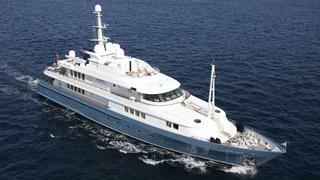 She can accommodate up to 12 guests, and has a crew of 21.